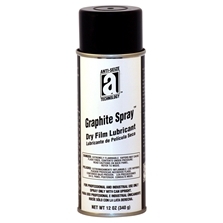 Graphite Spray™ Dry Film Lubricant contains high purity graphite allong with an organic binder that will adhere the coating to most surfaces. This leaves a dry, tack free film of highly lubricous graphite which will lubricate and reduce friction in parts so they slide or rotate easily. Mold release, foundry molds, hinges and hinge pins, drawer slides, chains, rollers, gears, sprockets, slides, nuts and bolts, automotive and industrial gaskets, plant machinery, lawn mowers, snow removal, garage doors and truck doors.